Fire protection to the structural columns and beams for a 2 hr FRL of the new office building. Fire Protection for 1 hour FRL to structural beams, columns and bondek within each transformer room. Constructing a Trimesh® / Vermitex® TH & Vermiduct® partition subdividing a factory unit. Wall Partition achieved an FRL of 4 hours and ceiling an FRL of 3 hours. 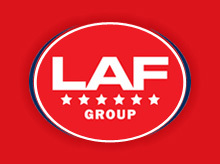 LAF carried out the Project Management of the concrete footings, fire doors and fire dampers for the project. Vertical and Horizontal Partition system also achieved an STC of 32.